Enter the draw and win prizes! At this time of year, my mind and heart turn towards our forefathers and mothers – especially the ancient ones who have left behind a myriad of mysteries for their modern children to unravel. There are so many wonderful places in the world that speak to the people they were and the beliefs, talents, and skills they possessed. This solstice, I would like to focus on one such place that was built, it seems, specifically to honour the winter solstice sun: Newgrange. Predating Stonehenge by about a thousand years, this monument in Ireland has been designated a World Heritage Site by UNESCO. It is older than the Mycenaean culture of ancient Greece and the Great Pyramid of Giza of ancient Egypt. On the night before the solstice, many people are drawn to this temple to wait for dawn. Those lucky enough to win a lottery to gain access to the interior may witness the 17 minute long illumination of the chamber by the light of the rising sun. 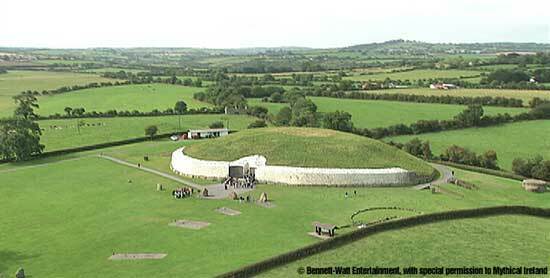 The Neolithic people who built Newgrange did so without metal; they used tools made out of wood, bone, antler, or stone. Not only did they build this entire temple with such tools, but they decorated it with carvings as well. 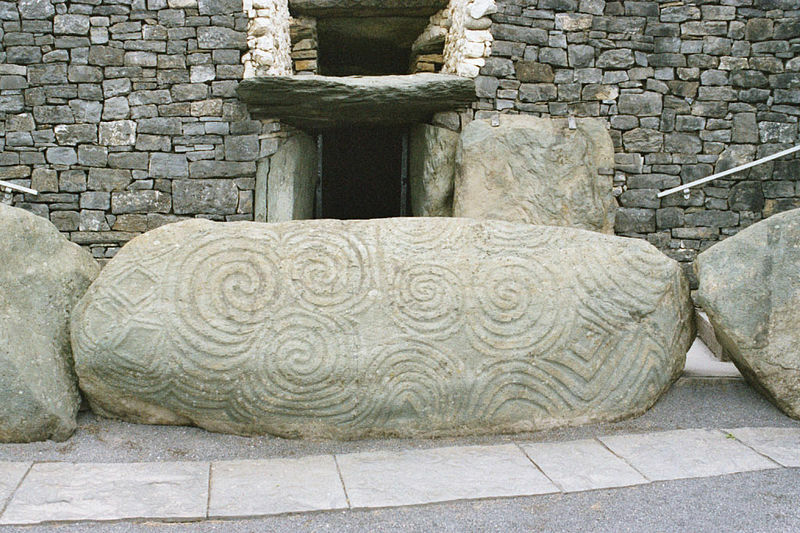 One of the most famous examples of Neolithic stone art is the entrance stone. It is 10 feet long by 4 feet wide and has triskele – like carvings all over its front. 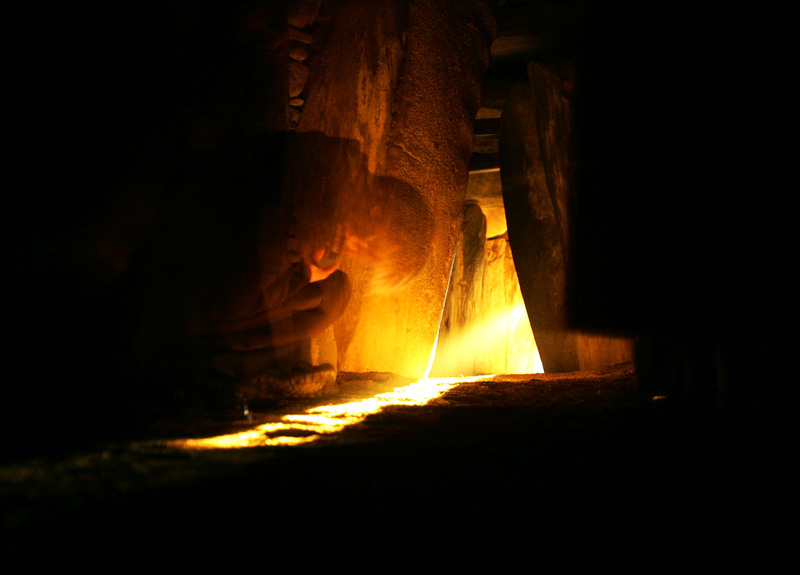 If you would like to learn more about Newgrange, or perhaps try your luck at the lottery to visit next year, the website http://www.newgrange.com/ is very informative. Is Gary Kirk of London, Ontario! He is the winner of the grand prize draw. He has until December 8 at midnight to contact us. If contact isn’t made, another name will be drawn on December 9. New winners drawn…..Janine Frenken and Heidi Cervi! You have until midnight on Wednesday, November 14 to contact us. Otherwise, new names will be drawn on November 15. Congratulations to Kim Beverly and Karen Szabo, our two new winners of any sterling silver jewellery piece with a value up to $100! These are unclaimed prizes from our earlier draws. You both have until midnight on Wednesday, November 7, 2012 to claim your prize – after that, we will draw two new names. The grand prize still hasn’t been claimed either. We are giving until the end of November for the winner to contact us. If not, another draw will be done on December 1. The lucky winner of our GRAND PRIZE draw is…. Jeff Dickinson!! Congratulations, Jeff – you have won your pick of any sterling silver band with 14k gold raised borders, valued up to $425 CAD. Birds and Dogs, sterling silver with 14k gold raised borders. Don’t despair if luck was not with you this time around. We still haven’t heard back from two previous draw winners. If they don’t contact us by November 1, we will hold two new draws! 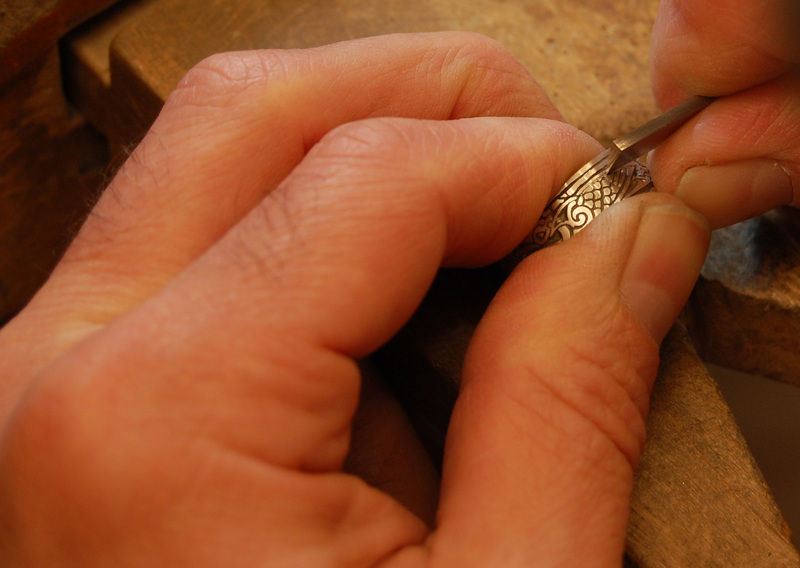 Some of our more intricate designs need a wee bit of engraving for definition and a clean, sharp look. 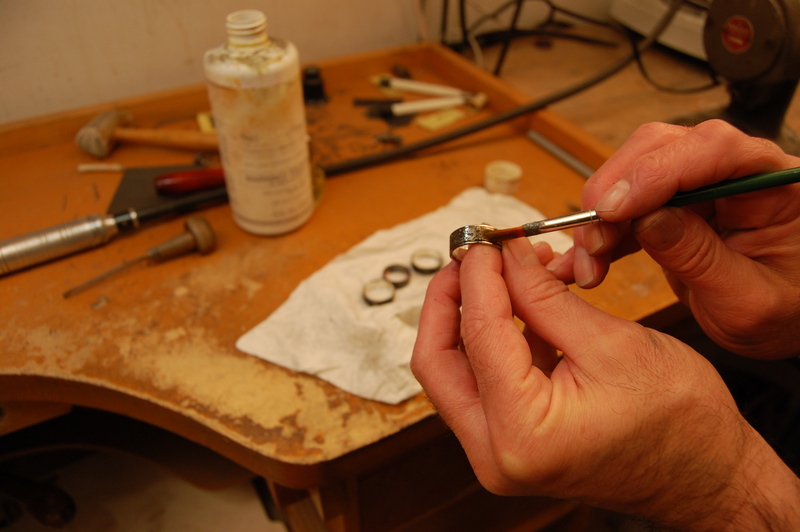 Outside polishing, also with jeweller’s rouge. Blackening the background of the design. Finished and ready for some happy customers. Is Martha Griffin-Jones of Tontitown, Arkansas! Congratulations, you have just won a sterling silver necklace or ring of your choice, valued up to $100 CAD. Next month is the big one! We’ll be putting all the names back into the hat for our final draw. One lucky blog follower or Facebook fan will win a sterling silver and 14k gold ring, valued up to $425. What remains of the sprue needs to be filed off. 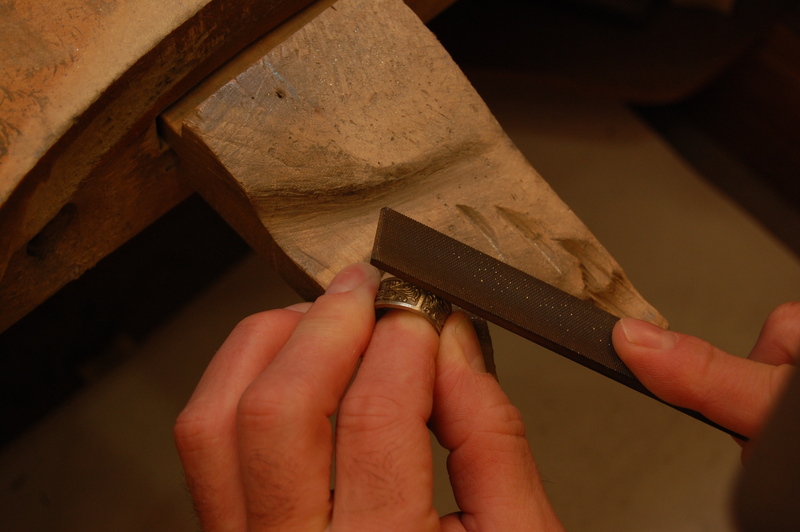 All bumps and snags on the inside need to be ground smooth. Rounding it out with a rawhide mallet and mandrel. 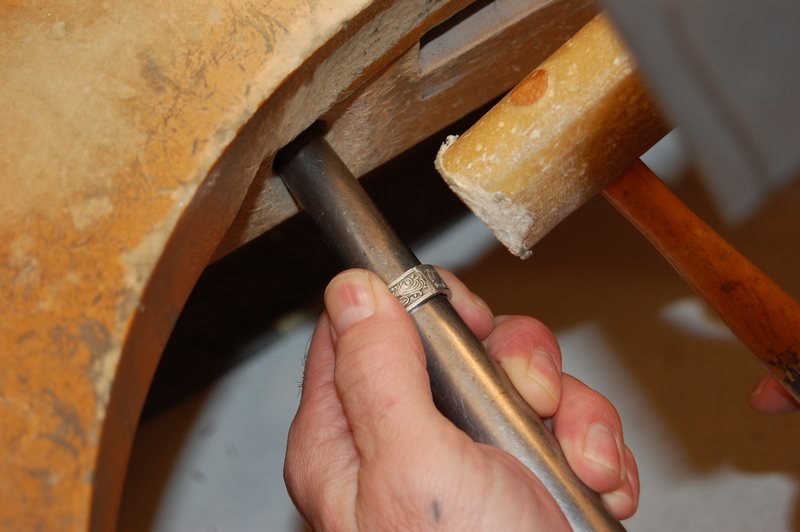 Smoothing and rounding the inside edge. 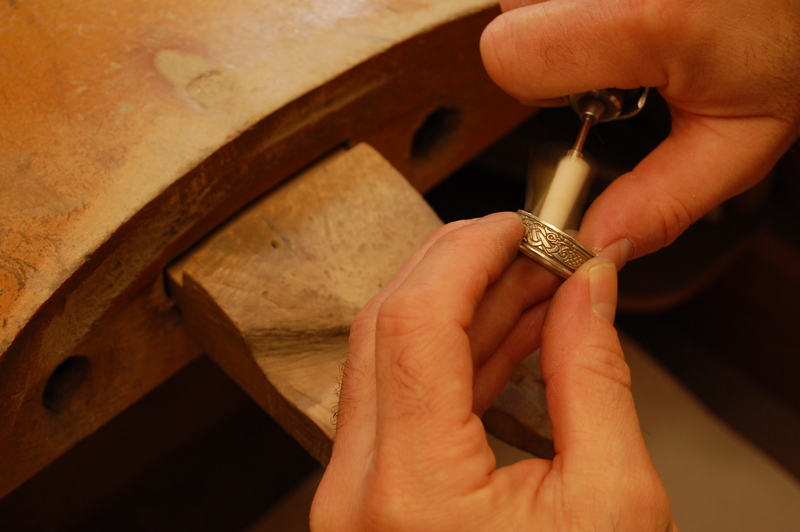 Each piece gets stamped .925 for sterling silver or 14k for gold. 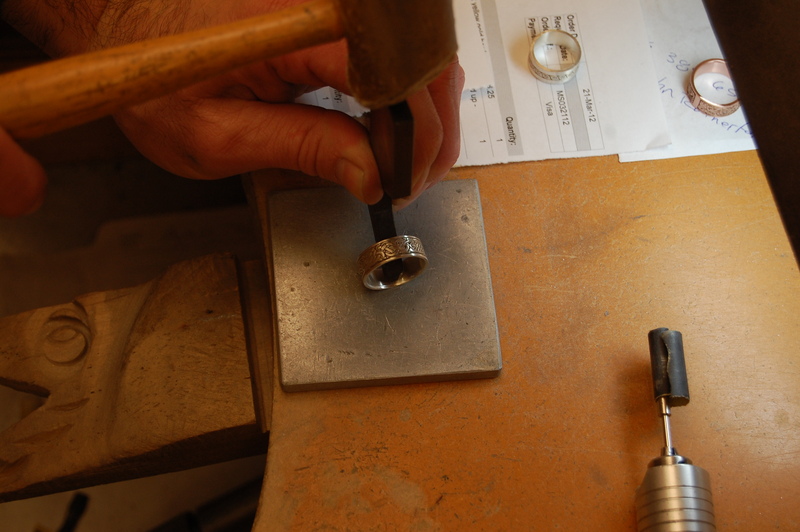 The ring is not quite done yet – engraving, polishing, cleaning, and antiquing are to come in the next post! 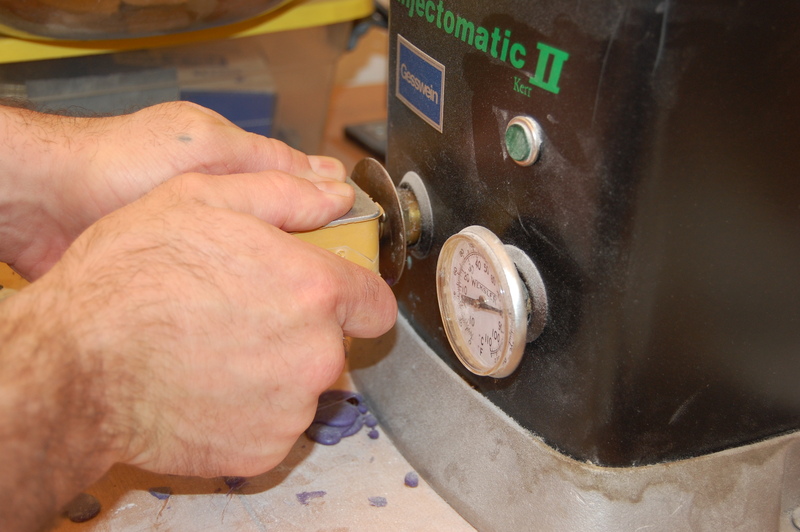 Injecting melted wax into a ring mould. 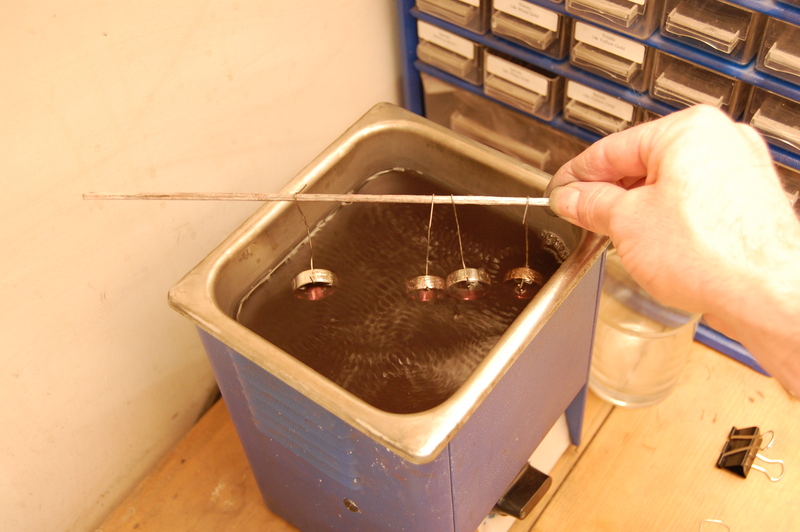 Here the wax model is set and ready to be removed. 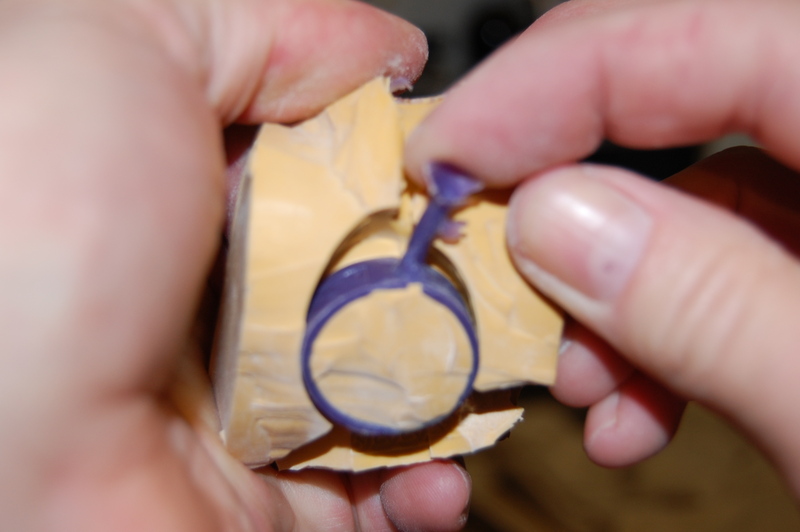 The wax ring models are being cut and sized according to order. 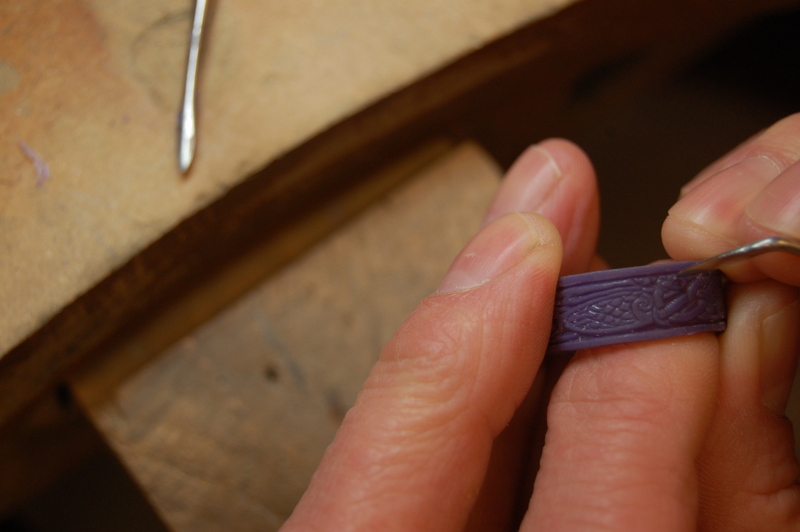 Cleaning up the detail with some wax engraving. Now the wax models are ready for delivery to the casting house. 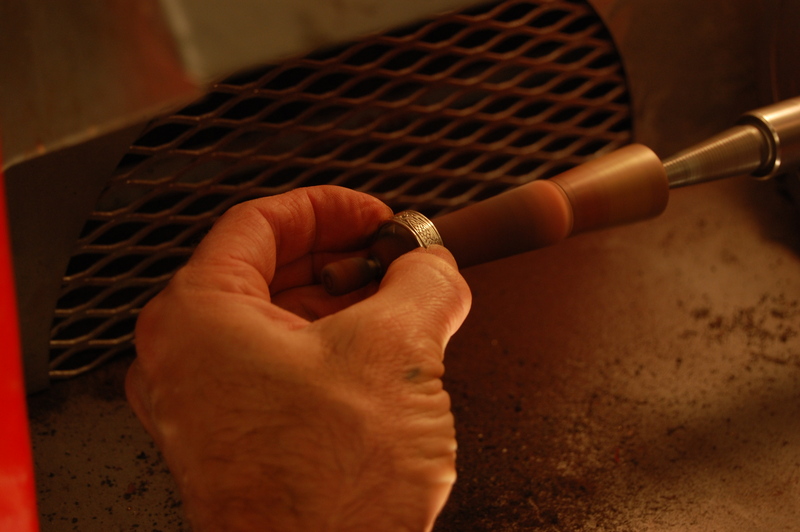 There they will be cast into silver and gold by the lost wax process. 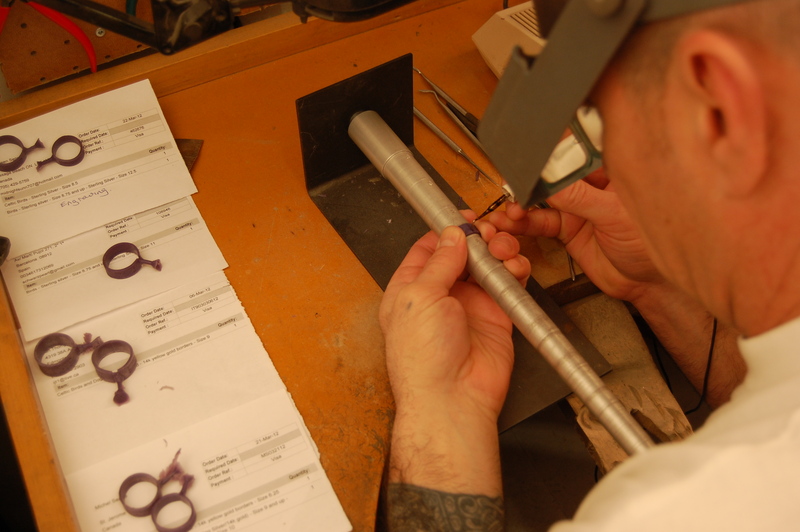 That’s when they will come back to us for sizing and finishing. 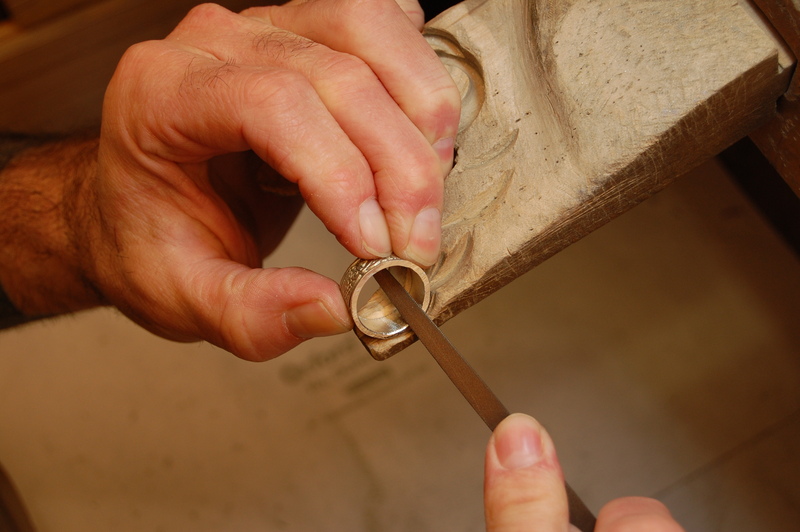 In part one of this article, the term “karat” was identified as referring to the purity of gold. 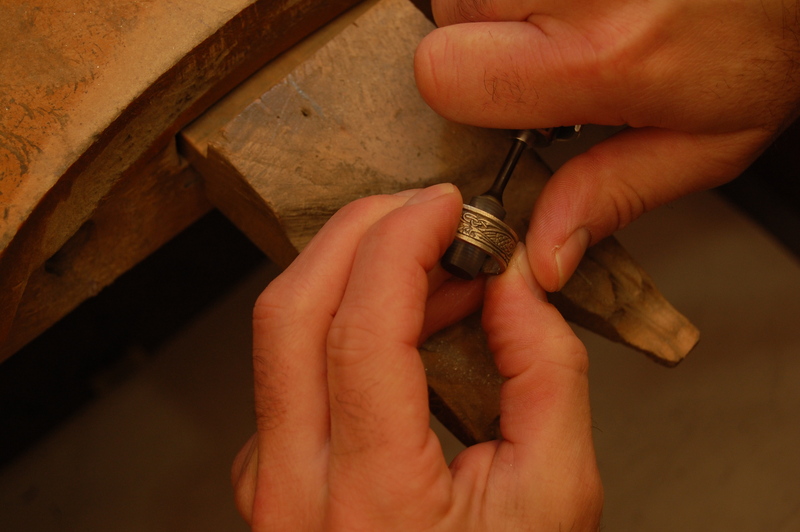 24k gold is the purest form of gold, and as the number of karats lessens, so does the purity of the metal. Yellow Gold: Silver, Copper, and Zinc. Yellow gold is the most popular worldwide. 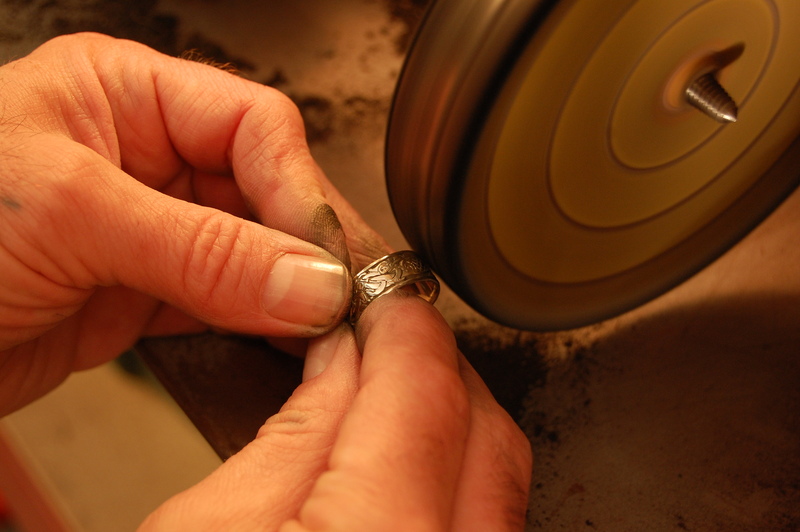 White Gold: Nickel, Zinc, Silver, Platinum, and Palladium. Brilliant luster. Pink (Rose) or Red Gold: Copper and Silver. Pink gold has become increasingly popular and looks lovely when combined with yellow, white or green gold. Green Gold: Silver, Copper, and Zinc. Green gold is being used more and more with pink and yellow gold to make uniquely contrasting designs.